Our Voter Guide offers our analysis and endorsements of a number of key ballot measures APANO believes is important to our AAPI communities in Oregon. 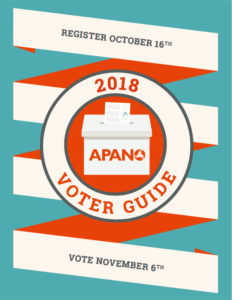 The guide includes a brief explanation of what the ballot measure does, how it supports or affects our community, and APANO’s position for the measure. APANO also offers comprehensive Voter Guides in multiple languages! See below for guides in Chinese (中文), Vietnamese (Tiếng Việt), Korean (한국어), Spanish (Español), Tagalog, and Russian (русский)! You can also see a list of Ballot Measure Endorsements here and Candidate Endorsements here.